This Reader's Theater is for 4 students. It is a rhyming script and students will need practice getting in the sing song voice of it. Due to the nature of this, there aren't as many pages as other scripts. The challenge for students is saying things in a way that keeps the rhyme while using emotion. 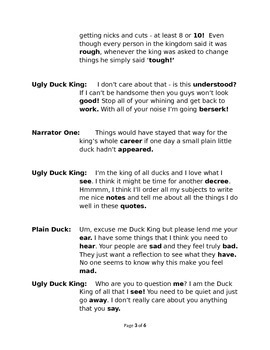 In the script, there is an Ugly Duck King who is super selfish and everything. 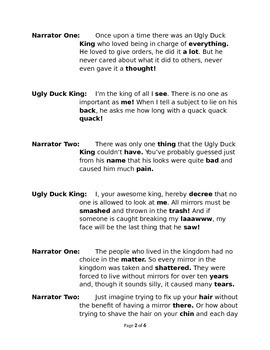 Because he is so ugly, the duck king has all the mirrors in the kingdom smashed which makes everyone sad when they’re thrown in the trash. With a little bit of luck, the king meets a plain little duck who helps him to change all of his ways and soon everyone is giving the king praise. The way that this story is told – is in rhyme and each word that rhymes is in bold. Make sure you pause on each darkened word so that the rhyme itself is easily heard! There is a small writing assignment for students at the end of the script. If you like this script, try some of my others that rhyme like The Love Bug or The Queen of Hearts in Court. I use reader's theaters to encourage my students to practice fluency. It is a fun way to do something that they need. Most of my scripts are in black and white so they photo copy easily. The problem with many other reader's theaters is that students spend a lot of time waiting for their part. When you have a small group they get more practice in and less off task behaviors take place. My name is Melanie Whitesides but my store name is Wonbyone. I have many other twisted fairy tales and regular fairy tales at my site. You can save money by buying them in packs. I hope that your students enjoy this script as much as mine did. Let me know how things go! 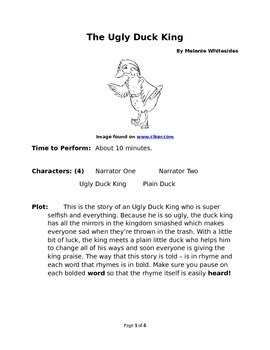 The Ugly Duck King - Rhyming Readers Theater by Melanie Whitesides is licensed under a Creative Commons Attribution-NonCommercial-NoDerivatives 4.0 International License.